February is the shortest month of the year and yet it seems endless. It's extremely cold outside and after the festive mood of the winter holidays and the "healthy Jan" resolution for the new year, we might feel a bit low. We know that the four cheeses pasta could be on your black list of foods right now, but nothing could be further from our intention than to make you ditch your diet and your healthy lifestyle. We simply thought that with this weather and the bikini test still far away, we could inspire you for your next cheat meal with this nutritious recipe which is still a well-balanced dish rich in proteins and carbs. Penne pasta: this type of pasta was invented on the 11th march 1865 in Genoa and was originally sold in a yellow colour obtained by adding saffron to the dough. Our Sardinian penne are made respecting the ancient pasta making traditions, including the double-drying process and the bronze die passage to allow maximum porosity and to preserve its quality and texture. Badeconca pecorino cheese: a semi-matured cheese obtained from free-range sheep's milk and one of the most popular Sardinian pecorino cheeses. Fiore sardo cheese: an ancestral cheese with a strong flavour that best represents the inner part of Sardinia island. It’s also one of the first Italian cheeses to obtain quality recognition from the European Union. Ricotta cheese: probably the most versatile cheese used in a wide variety of dishes, from pasta to desserts. Ricotta is very ancient and was well known among Romans and Greeks. It’s very nutritious as it is obtained from milk’s whey which is highly rich in proteins. Erborinato cheese: this is the Sardinian blue cheese, made from free-range sheep’s milk with a creamy texture and a sweeter flavour compared to other blue cheeses. 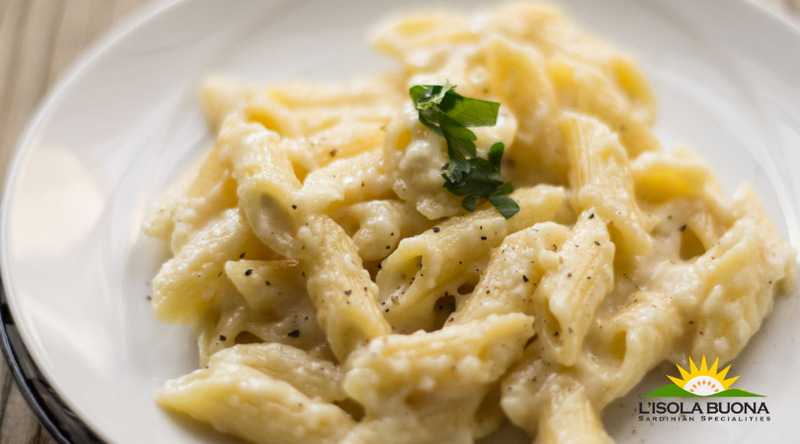 Try the four cheeses penne recipe at home and tag us on your pictures on Facebook, Twitter or Instagram. This is one of the best cheat meals you could ever dream of and with the load of proteins, well balanced with the carbs, you won’t feel guilty indulging in it.